Cap is variable from reddish brown to dark cinnamon with a paler buff margin; convex, centre becoming depressed with a small umbo; 3 to 7cm across. Gills mature to a pinkish buff and are moderately crowded. Latex is white, unchanging; abundant; taste initially mild, becoming slightly bitter. 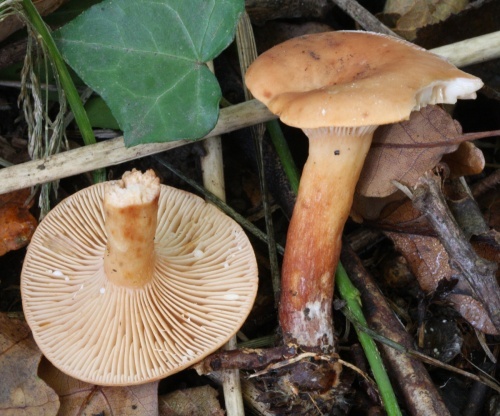 May be confused with Lactarius tabidus but that species is smaller and usually with birch, and the watery white milk of L. subdulcis does not dry yellow. Usually found with beech but has also been recorded with oak and birch.